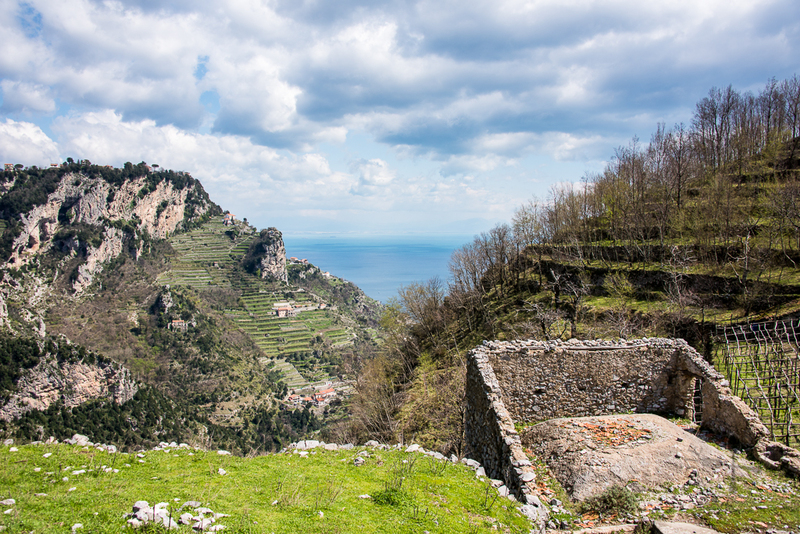 Sentiero Degli Dei, translated as Path of the Gods, is the most popular hike in Amalfi, and it’s no wonder as the views are immensely beautiful! When we were there in April, there were very few people hiking the path, so there were plenty of moments of tranquillity and serenity. 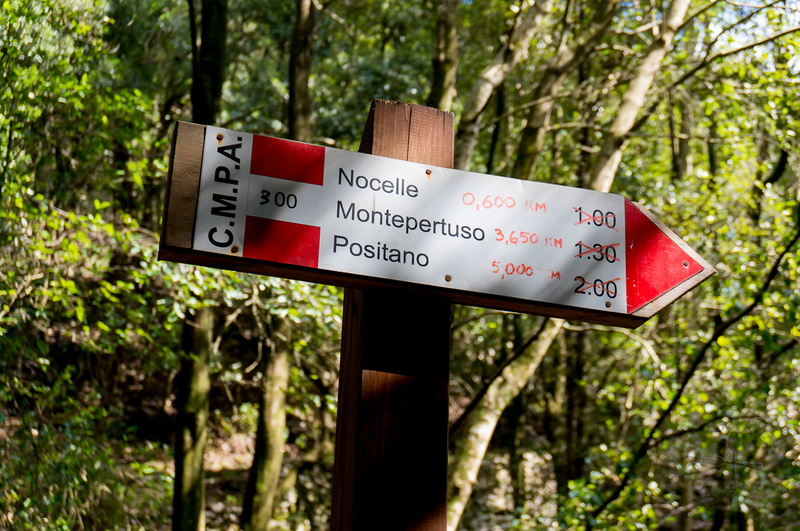 The hike runs from Bomerano (Amalfi side) to Nocelle (Positano side) and while you can start from either side, I highly recommend starting from Bomerano (Amalfi side) – you will know why at the end! Before you start, do stock up on some drinks and food (like sandwiches and snacks) wherever you are at as it’s going to be a 3 to 4 hour hike, and you won’t be able to get any food during the hike. There is also a cafeteria at Bomerano (see photo below), so you can buy some food there too if you prefer. 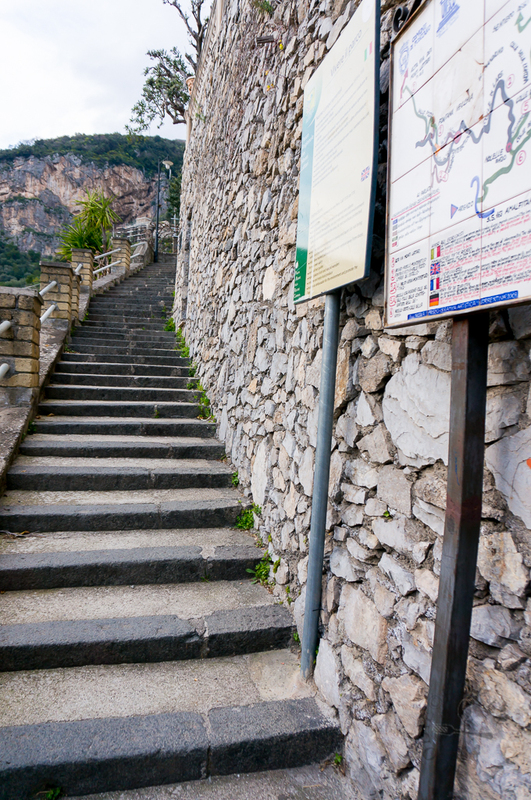 To get to Bomerano, first you’ll have to get to Amalfi. 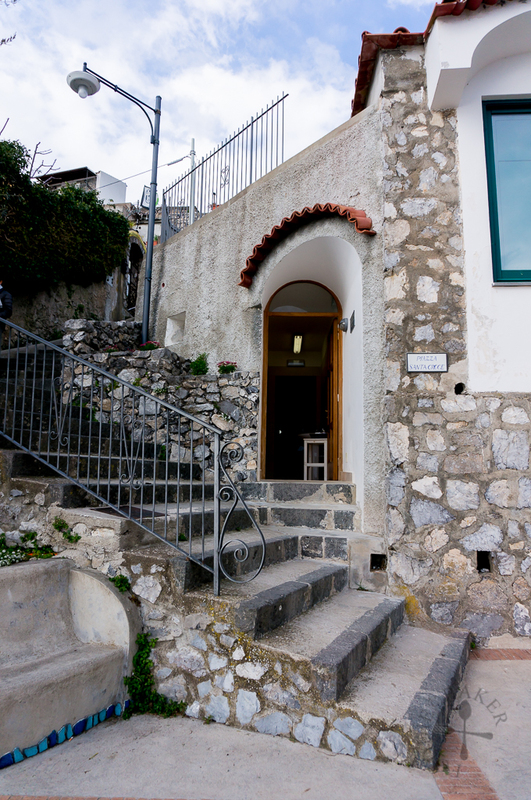 We left Sorrento in the early morning and took Sitabus #5070* to Positano, where we would be spending a night at. After dropping our luggage at the BnB, we headed out to the nearest bus station and caught Sitabus #5070* to Amalfi. We then boarded the Sitabus #5080* from Amalfi to Agerola. I doubt you will miss it as many tourists will be boarding that bus too. 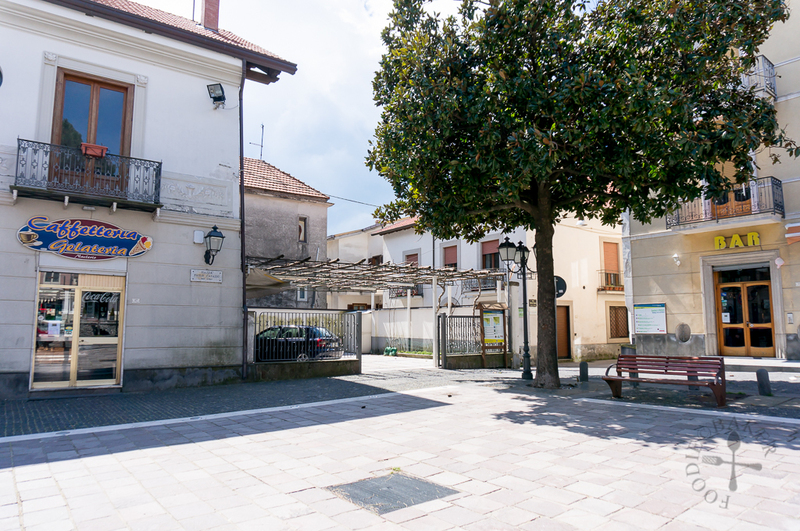 After a 25-minute ride, alight at Bomerano – again, you don’t have to worry about missing the stop, because most of the people aboard the bus will be alighting at Bomerano too – but of course you can double check with the bus driver. The bus tickets must be purchased in advanced in “tabaccherie” (cigarette shops), newspaper stands, bars or cafeterias. The hourly tickets cost €2.20 each while the 24-hour tickets cost €8 each. So… do your math and see which one is more worth it! 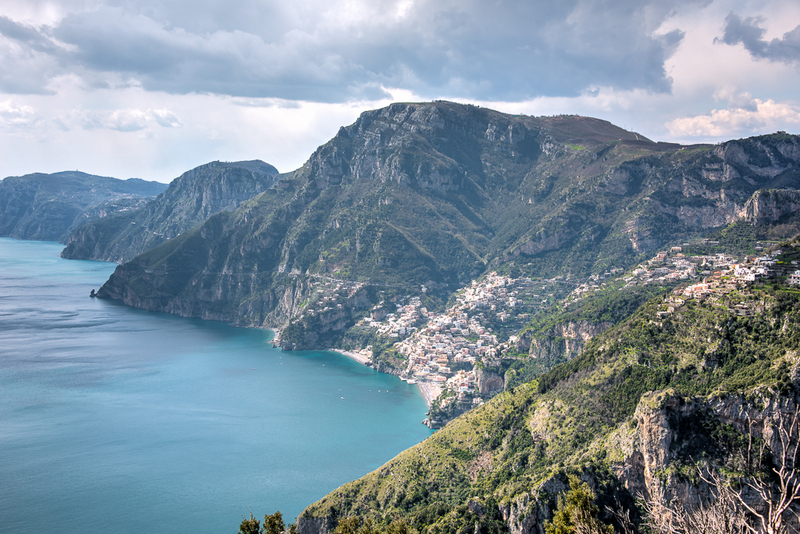 One thing to take note is that the Sitabuses will leave from the terminals on time but may not reach the destinations on time due to traffic conditions – given the winding roads along the Amalfi Coast, it’s perfectly understandable. Do take note especially when you are planning back-to-back bus trips. We originally wanted to take the 1015 bus from Amalfi but we missed it by a few minutes, so we ended up having to take the 1230 bus. As it was still spring, the weather was a lot more forgiving. After alighting the bus, you will see a cafeteria and a bar and just next to the bar is a signboard directing you to the hike. 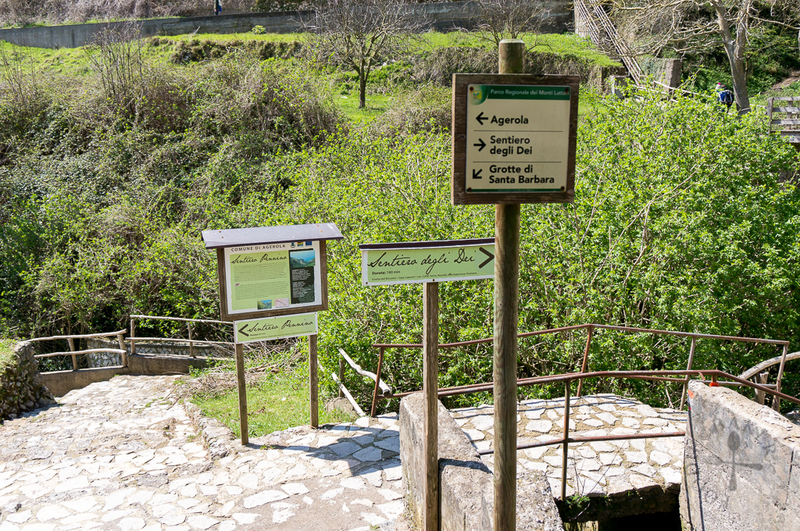 Getting to the hike shouldn’t be difficult – just follow the signs! 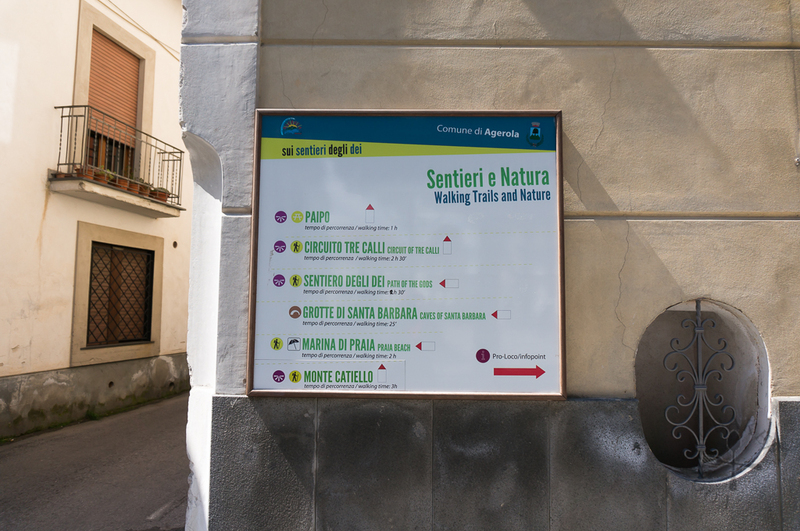 In case you missed the big signboard, there are small signs to lead the way – and they offer a guide on how long the hike will be. More signs leading to various hikes. If you had downloaded an offline version of the map onto your smartphone via Google Maps, you can use GPS to locate where you are on the map – no data is required! 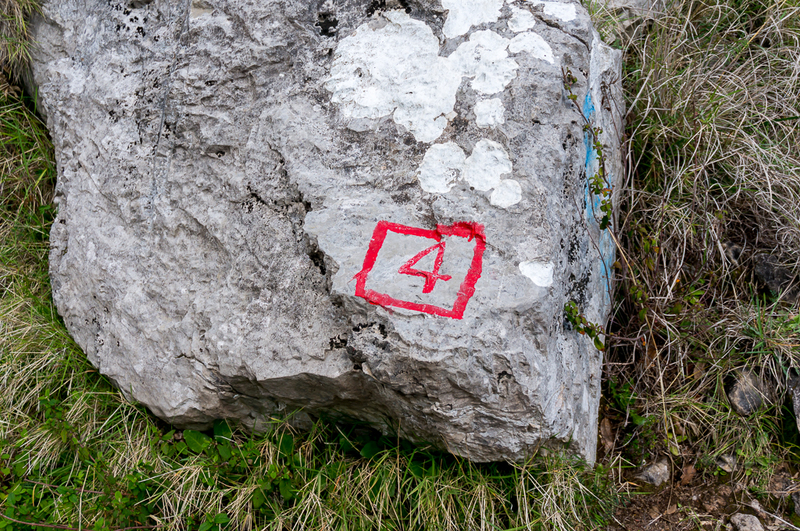 Halfway through the hike, we noticed that there are numbered tiles being attached to rocks – then we realised they are like checkpoints – and it’s a good thing they are numbered because you can countdown together with them! Plantation along the cliff – will you want to stay here? The numbered plates also had an emergency number – a number that is good to know but wish that you’ll never need to use it. 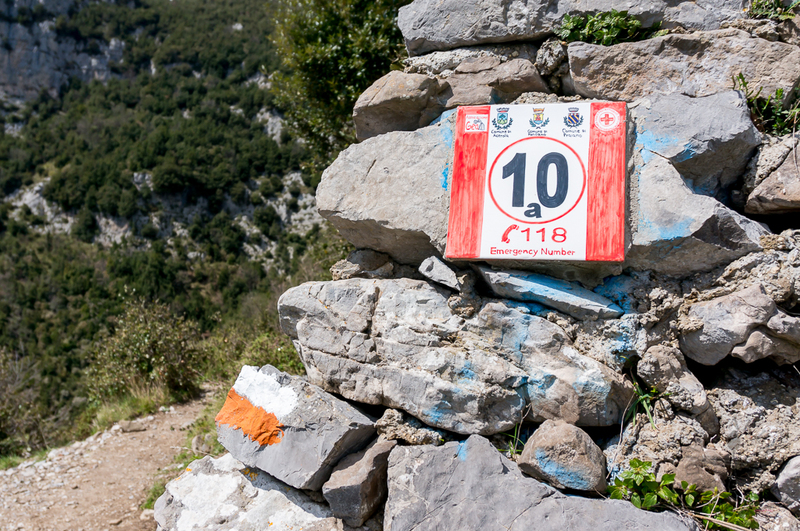 Besides the numbered plates, rocks painted with those white and orange stripes can also be found along the path – we are guessing that they are markers for hikers to stay on the path. 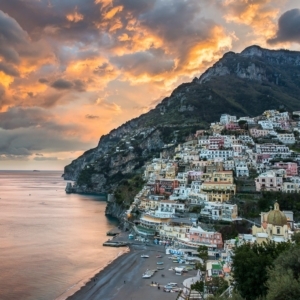 Positano from afar – look at the ominous dark clouds! The dark clouds are gone! I’ve read that the con of hiking the path during spring time is the erratic weather – but thankfully we were blessed with no rain that day. 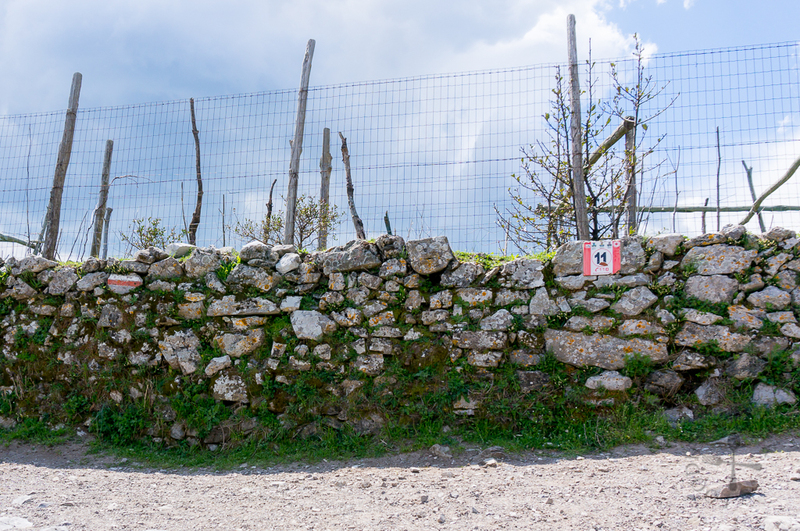 In general, there are more downslopes than upslopes throughout the hike from Bomerano side, one of the reasons why it’s better to start the hike from Bomerano. The numbered tile is missing, but you can still countdown with this painted one! Somebody decided to make things right. 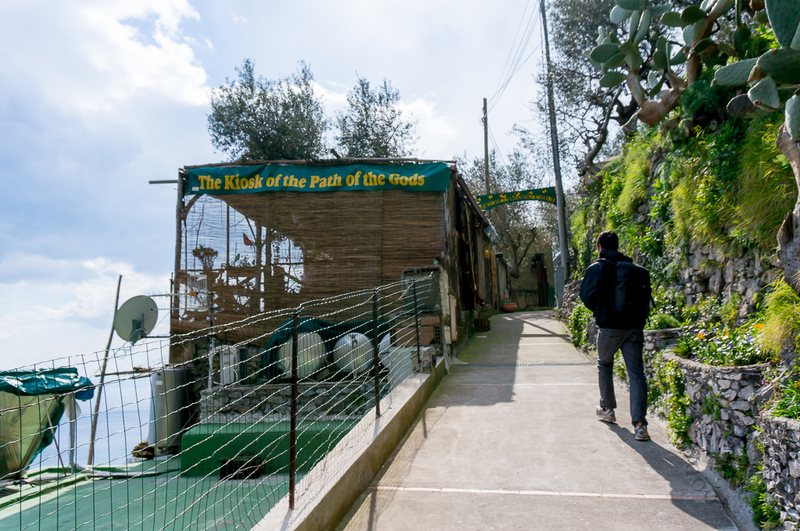 And when you see the above kiosk, this means that you have completed the hike and reached Nocelle, a small town of Positano, resting at 400 metres above sea level. Since we had worked so hard to complete the hike, it’s only right that we reward ourselves with a break! 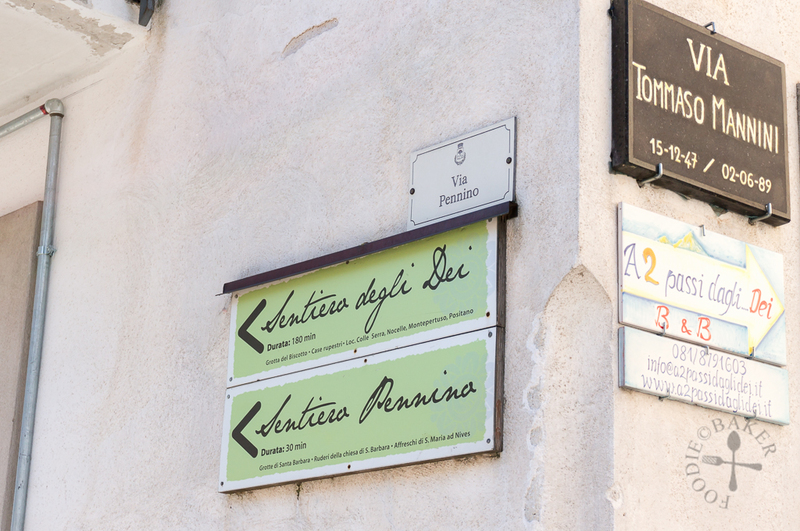 We headed into this small alley to reach Ristorante Santa Croce, a restaurant operating since 1961. 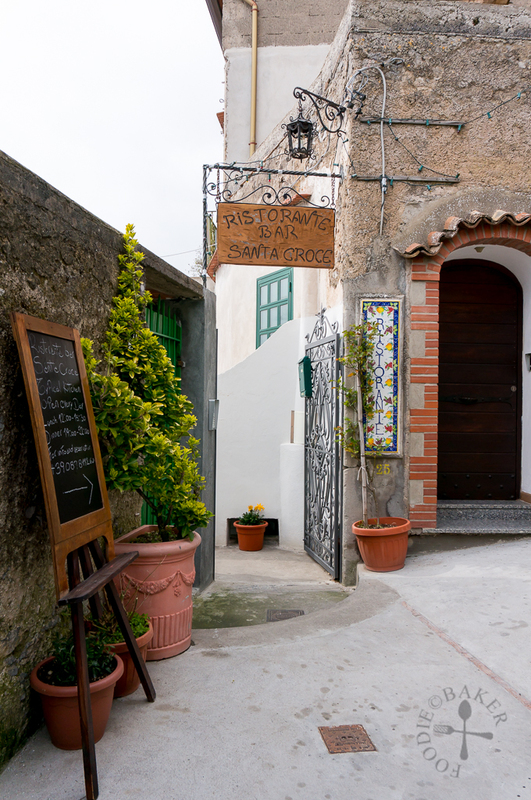 The restaurant has an unobstructed view of the coastline, so you can enjoy the view, rest your legs, sip a glass of wine and have a meal there after the long hike. We were lucky we managed to reach just before their last order closed – I was absolutely famished! 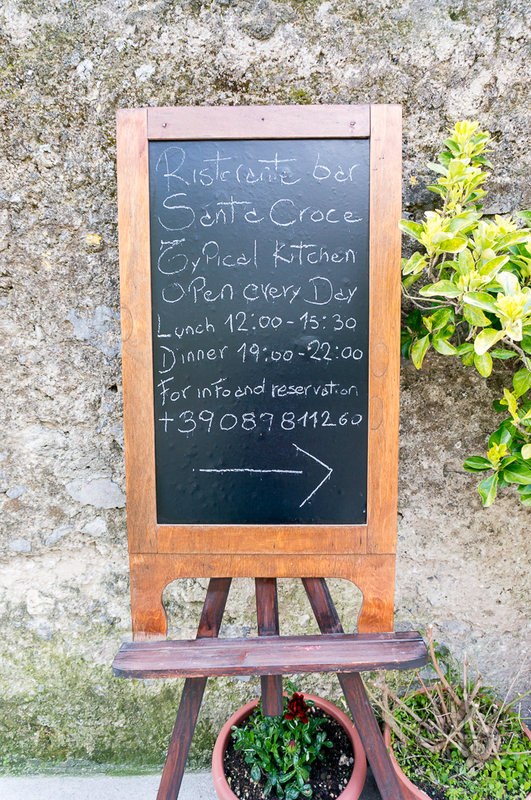 The restaurant does not offer much – menu can be found here and here. 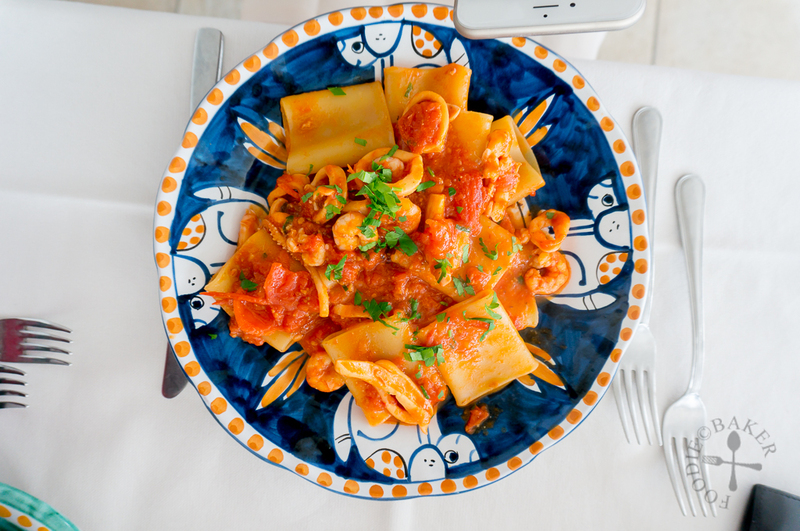 X ordered a pasta dish – the pasta is perfectly al-dente with a good serving of squid and shrimp in tomato sauce. But I was so more in love with the plate – it’s so beautiful! 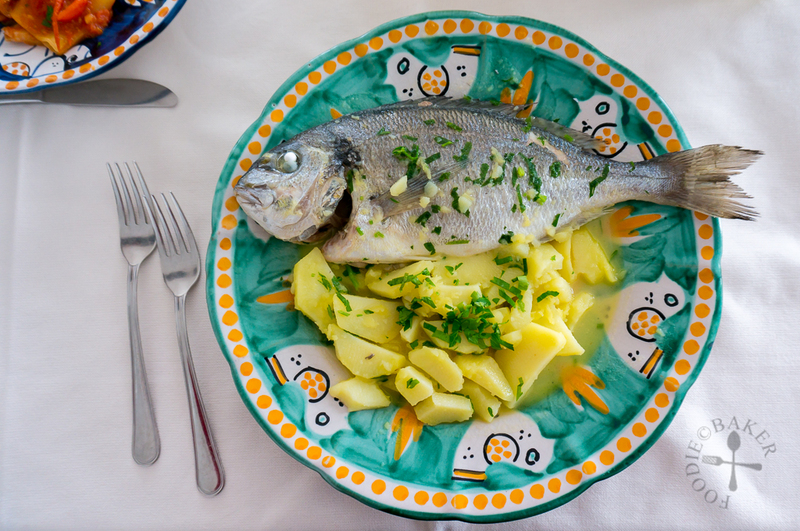 I ordered the daily fish with potato in a white wine sauce – it looks really simple and that’s the beauty of it because the freshness of the fish really stands out. The aromatic white wine sauce does not overpower but complement the fork-tender fish meat. Delicious! The total bill came up to €35 for the 2 of us (we didn’t order any alcohol), a little expensive but we left full and satisfied. 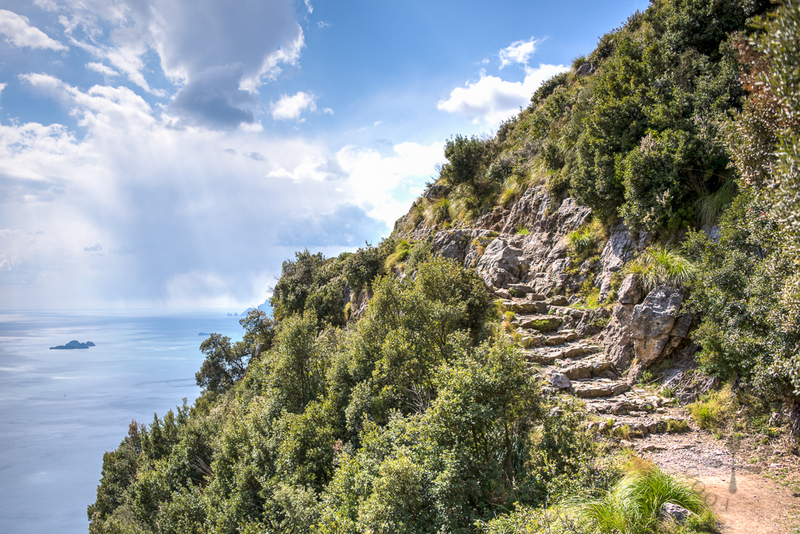 And here’s the main reason why you should not start the Sentiero Degli Dei (Path of the Gods) hike from Nocelle side – in order to get to Nocelle from Positano, you will need to walk up approximately 1,800 steps! We counted the steps and ended up with 1,770 (we did it to keep ourselves entertained while climbing down), but we may have missed out or double-counted some of the steps. 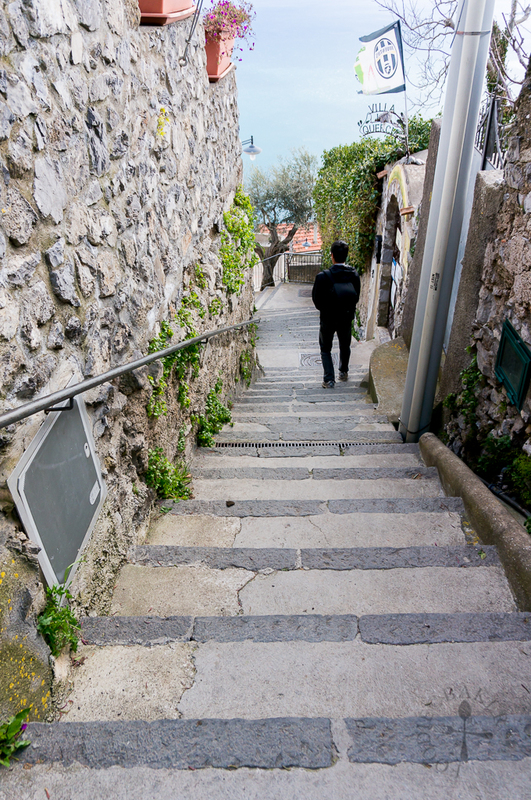 It took us about 45 minutes to reach to the bottom – can you imagine if you do it the other way round? 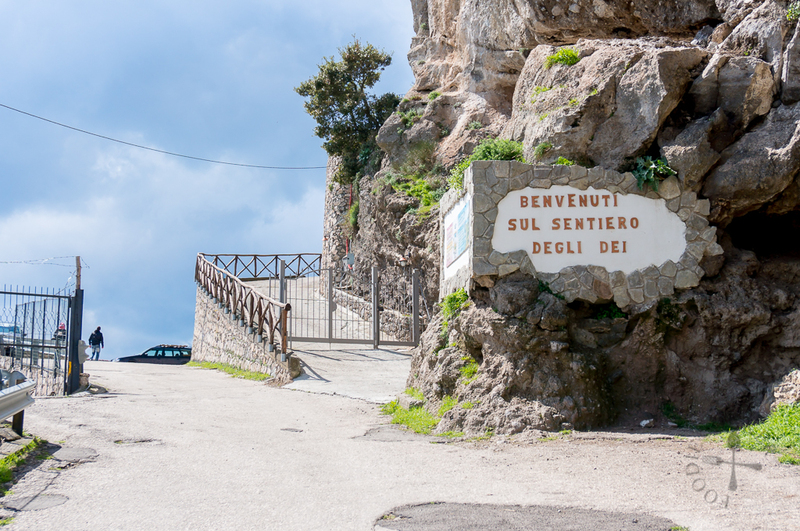 I think I’d be so drained of energy that I won’t be able to do the Sentiero Degli Dei hike any more. Finally we reached the end of the steps! It was a really long walk down! 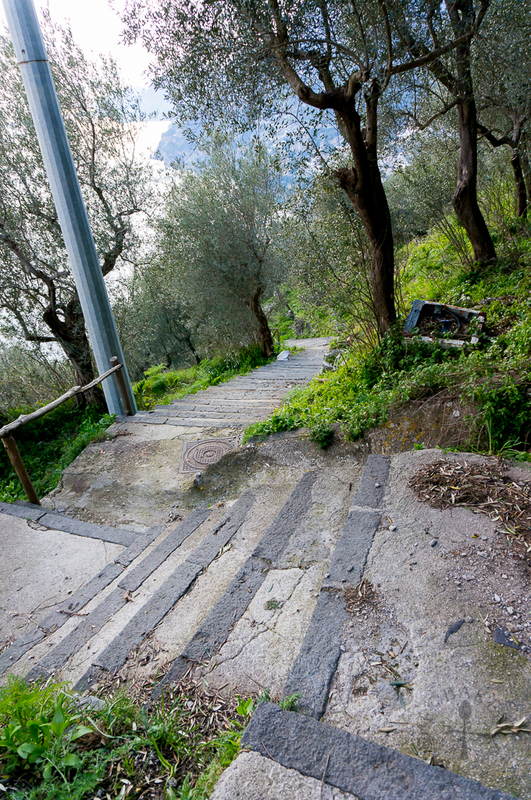 The hike will last about 3 to 4 hours, add an additional hour if you plan to hike down the steps from Nocelle to Positano. 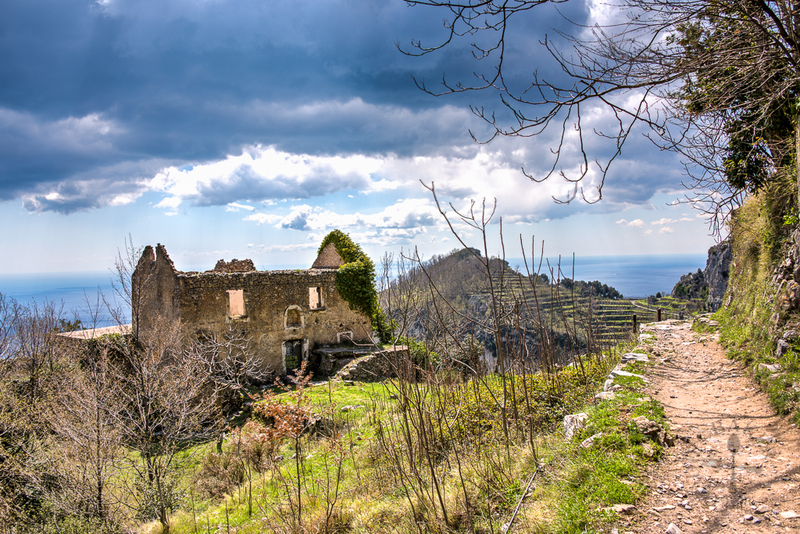 If possible, start the hike from Bomerano (Amalfi side) for a slightly easier hike. 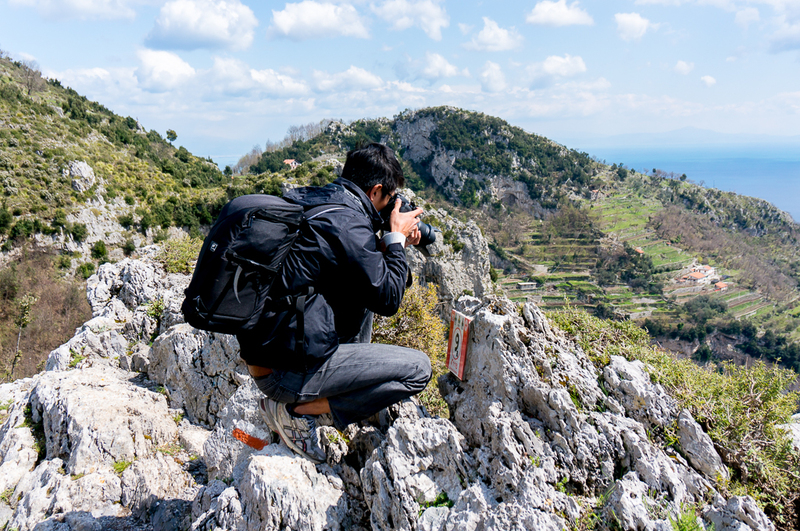 As the hike is quite cliff-hugging, if you are afraid of heights, the hike may not be suitable for you. Do wear proper hiking shoes or sports shoes so as to be kind to your ankles, and pack along water and food (plenty especially during summer) to keep your energy level high throughout the hike. Hi Andrea, thank you so much. Comments like yours will motivate me to churn out better travel posts. Glad you had a good trip and have a fun holiday! OMG thank you for this informative blog post!! Wonderful. I was wondering–did you head back to your original place (Sorrento?) after the hike? I want to do the hike but don’t have a proper backpack so I can’t take my luggage and end up in a new town for the night afterwards. I would need to return to my place whether it’s a hostel or airbnb. Hi Madeline! 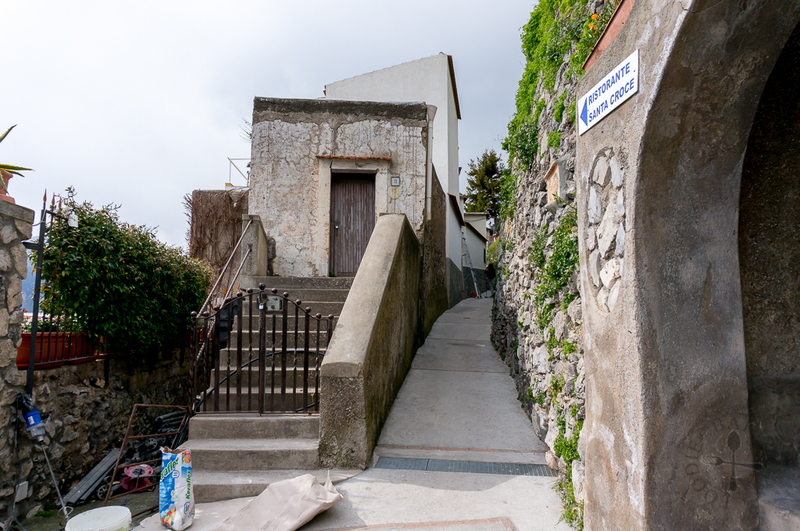 I will suggest staying at either Positano or Amalfi for the day you did the hike. More lovely photos! I totally agree with how you picked your starting point. Wow, that’s a lot of steps! 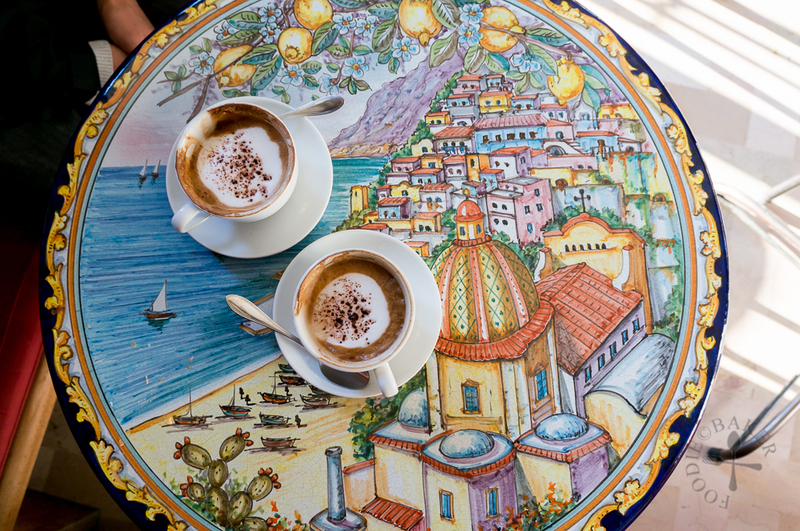 Beautiful table with coffee at the start and the last shot is breath-taking! Wow your photos are gorgeous! 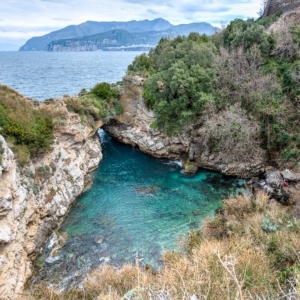 I would love to visit the Amalfi Coast too!